← How’s That Workin’ For Ya? 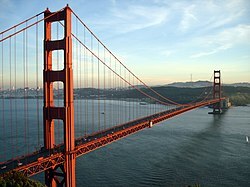 So I am actually writing this about a week in advance of posting it and I have a lot to still do in order to be ready for my 6 AM flight tomorrow to San Francisco. So today I want to share a few things that are worthy of your attention, that have to do with fitness, motivation and nutrition, but are not specifically related to each other. I have a video clip, a few recipes and some motivational quotes. Let’s start off with this video clip of Winifred Pristell. I have shared many clips of strong women doing strong things, but this clip is special in that Winifred is a 70 year-old powerlifter who can bench press 160 lbs. Trust me, that’s a lot for any female, let alone a 70 year old one. Just goes to show that age is not an excuse! Next up ~ I enjoy cooking, and since my boyfriend moved to Shanghai for two years (tell me about it!) I have had a lot more time to experiment with some new recipes. I love cookbooks, although I am kind of picky about them ~ I like nice big color pictures of what I am going to cook. I do pull a lot of recipes now from the internet (epicurious.com and Williams-Sonoma are two of my favorites) but I still like a new cookbook every now and then. Two recent acquisitions that I am using lately are The Primal Blueprint Cookbook and Gourmet Nutrition. 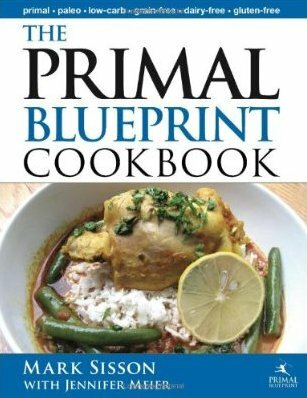 The Primal Blueprint is a “Paleo” cookbook, but you don’t have to subscribe to the whole Paleo diet philosophy to enjoy some of the recipes in this book. Here is one I made the other day which I loved, Bacon Broccoli Salad ~ I will give you the recipe as provided in the cookbook, although I just kind of eyeballed the proportions and cut back on the dressing. Of the optional add-ins, I used blueberries & apple. It might sound weird, but the blueberries and apple with the broccoli was really yummy. It was a great thing to make in advance and have to pull out for lunch. If you are vegetarian, you can certainly leave out the bacon (although if you’re not, it sure is a great addition ~ just use one that is nitrite and nitrate free). Another recipe from “The Primal Blueprint Cookbook” that I recommend is Swiss Chard Frittata. Again, I made a few changes (that’s the fun of cooking). I sautéed the onion and chopped up chard, then added it to the beaten eggs & herbs. I threw in some grated swiss cheese and some chicken sausage I had sliced and pan sautéed to brown it a bit. I put everything in a small round casserole and baked at 350 degrees for about 20 minutes (or until cooked through). I have sliced this up & heated it in the microwave for a quick, easy, nutritious meal. 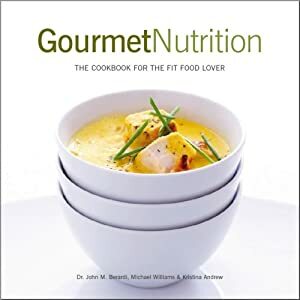 The “Gourmet Nutriton” cookbook is written by the folks at Precision Nutrition and is meant to provide yummy food choices that make good nutritional sense. For those trying to loose weight, there is also discussion at the beginning of the book about some of the Lean Eating guidelines. Appropriate portion sizes are also spelled out in this cookbook, something I think many people struggle with (me included). Recipes are kept very simple, with a short ingredient list…prep time is very reasonable. The first recipe is for Stuffed Zucchini. This takes a little bit of time, but is really, really good. The recipe calls for serving this with tomato sauce ~ I omitted it ~ was very good without. And one final recipe, which I made last Sunday and noshed on for days…Pesto Chicken Pizza. The recipe calls for using a whole wheat tortilla, which would make 1-2 servings. I used a large super-thin pizza crust I bought at Whole Foods in the freezer section…I can’t remember the brand, but it was great (I hate doughy pizza though). So my pizza was more than 1-2 servings, which is why it was dinner and several lunches for me. I hope you have a great weekend, and I will be back next week! This entry was posted in Motivational, Nutrition and tagged 70 year-old powerlifter, age is just a number, Bacon Broccoli Salad, Gourmet Nutrition, pesto chicken pizza, Primal Blueprint Cookbook, recipes, Stuffed Zucchini, swiss chard frittata, Winifred Pristell. Bookmark the permalink.